The Fourth UK Carbon Budget is designed to help energy intensive industry and achieve targets for emissions in 2023. The Government has just added to this help by announcing a review in 2014. David Cameron has not faltered in maintaining the momentum required to reach UK carbon targets. But the suggestion is that industry needs help to maintain employment. A review in 2014 could superficially help by overturning changes and throw the country off-course to reach agreed climate targets. The Committee on Climate Change has recommended its original carbon budgets must be the absolute minimum. Zac Goldsmith from the Committee states that he sees any change as risking investors' money when they put it into clean technology. "It is therefore absolutely crucial that policymakers recognise that with the stroke of a pen, they can make a good investment bad." Joan Walley is worried about transparency, as 95% of the FTSE 100 companies report emissions voluntarily. Many others must follow that lead, with mandatory measures if necessary. She added, "The long term carbon-cutting commitments set out in the Climate Change Act are supposed to provide certainty that Britain is determined to reduce emissions by 80% by 2050." These MPs are set to provoke an about-turn on this review, given their monetary approach and green credentials. In addition, while some will complain, many other bodies, including many in the EEC, have begun to wonder how this review could help. The World Wildlife Fund have added their expertise on the subject by warning about indecision. Nick Molho, Head of Energy Policy at WWF-UK, said, "Failing to clearly endorse the Fourth Carbon Budget now will not only slow down urgent action on addressing climate change, it will also seriously undermine investment certainty in the UK's low-carbon sector and result in the UK missing out on the opportunity of creating hundreds of thousands of UK jobs in low-carbon manufacturing." This highlights the conundrum. More jobs for the low-carbon sector, but jobs to be threatened in the energy intensive industry. 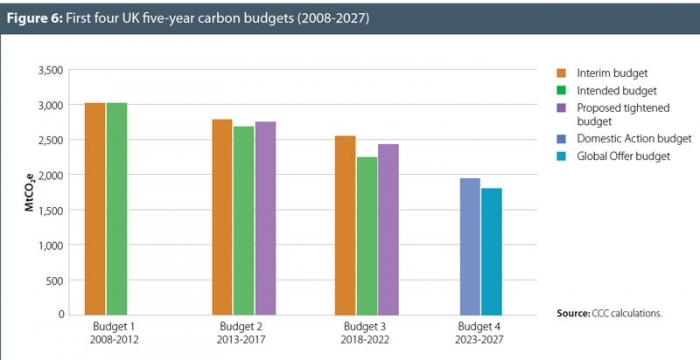 As we can see (in the Committee on Climate Change graph above), the Fourth Carbon Budget, for 2023, is approx. 65% of the First Carbon Budget in 2008. Reducing carbon emissions from today will cause any heavy industry to apply substantial investment to absorption, modification, outright fuel reduction and many other such measures. What the ECR states is that the admitted "bite" of the reduction is important to industry that is investing heavily in environmental technology. This watchdog must have teeth.